The 5M series is acclaimed for delivering extraordinary value. Its renowned performance characteristics, straightforward Diesel only technology and unshakable reliability have made it our most popular model in the 75-100 hp segment. The new 5M introduces a brand new array of controls and features that make it more powerful and more efficient to operate than ever. The new 5M. Whatever you need doing, consider it done. 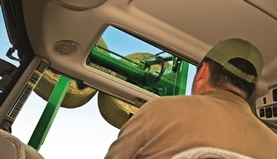 The loader view window and the cornerpost exhaust provide the operator with overall more visibility. This is especially important when doing loader work. 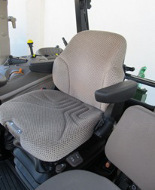 The tractor-ready feature is an option orderable from the factory for the 5E, 5M, and 5G tractor. 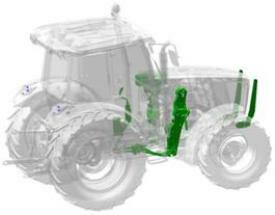 This option allows dealers to receive the tractor equipped with the loader components directly from the tractor factory. The tractors are delivered with the mounting frames, the independent mid-mount valve with hoses and hydraulic fittings, the mechanical joystick, and the multi-coupler mounted and tested. 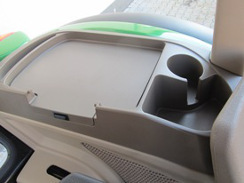 The design of the 5M Series low-profile cab is the same as the one from the standard cab. The only difference is the cab is sitting 4 cm (1.6 in.) lower. The minimum total height of the low-profile cab is 2485 mm (8.2 ft) with 480/70 R28 tyres. Other tyre sizes are also available for this tractor. 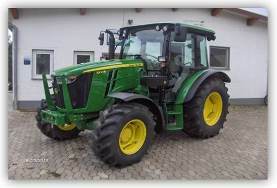 The fuel tank size of the low-profile tractor is 165 L (43.6 gal.). From a technical point of view, the 5M Narrow Cab Tractors are identical to the standard 5M Series Tractors. Due to the narrow configuration, however, there are some slight changes to meet dimension requirements. Compared to the standard configuration, handrails, footsteps, and fenders have been modified to meet the required dimensions. The size of the fuel tank is 170 L (44.9 gal.). The 5M Series Utility Tractor offers a choice of three different transmission options to ensure operators have the correct transmission for the task at hand. In addition to the three transmission options, the creeper feature is available on the 16F/16R PowrReverser for tractors needing additional slow speeds. The minimum speed for a tractor equipped with creeper is 0.3 km/h (0.19 mph). The 32F/16R PowrReverser transmission provides 32 forward speeds and 16 reverse speeds for the ultimate in speed selection from up 0.3- to 40 km/h (0.19- to 25 mph) with creeper. Furthermore, the 32F/16R transmission on the 5M Series provides solutions like push-button controls and the easy-to reach electrohydraulic high/low selector. No matter what a utility tractor has to offer, there is no substitute for raw power. The 5M Series Utility Tractor from John Deere provides just that. Power ranges offered from 75 engine hp 5075M model, all the way up to 115 engine hp in the 5115M model. *At 2200 rpm rated engine speed according to 97/68/EC. The heavy-duty cylinder block provides greater strength and rigidity, which results in an extended lifecycle. 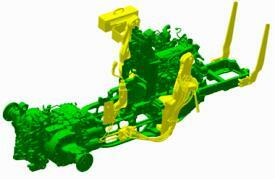 Statically- and dynamically-balanced crankshaft reduces engine vibration. The high-ring piston design reduces the non-usable air in the combustion area of the cylinders for improved fuel efficiency and combustion so operators receive the most power from every engine stroke. Ni-resist inserts reduce ring groove wear, which would lead to less effective combustion, so operators have an engine that is proactive for performance. Keystone-shaped top rings move slightly in the groove to clean the carbon deposits, conditioning the tractor to remain ready to work. Plasma-coated for reduced drag on cylinder wall and increasing overall tractor life. Full-pressure lubrication system ultimately protects the owners' wallets from maintenance costs. The underside of each piston and piston pin is sprayed with cooled and filtered oil, which eliminates excessive heat for longer life. The full-flow filter allows the cleanest fuel to be delivered to the engine for maximum performance and filter bypass so the tractor will never be starved for oil due to an exhausted filter. 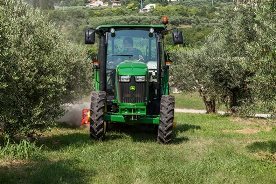 Whether an operator is a lifetime tractor driver or a first-time user, the 5M Series is a utility tractor that is extremely straightforward and easy to use. 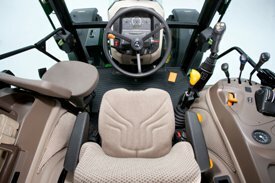 The 5M Series has grouped critical controls on the right-hand console in a logical, easy-to-find manner, making tractor operation more efficient for all. On the 5M Series right-hand console, the engine throttle control, selective control valve (SCV) levers, power take-off (PTO) engagement, and hitch-lift control levers are grouped together, making it easy for operators to locate needed controls. The 5M 16F/16R PowrReverser™ transmission and 32F/16R transmission have range synchronisation. This allows for the operator to up shift from B to C to D range without having to stop. In addition, the operator can downshift from D to C range without having to stop.